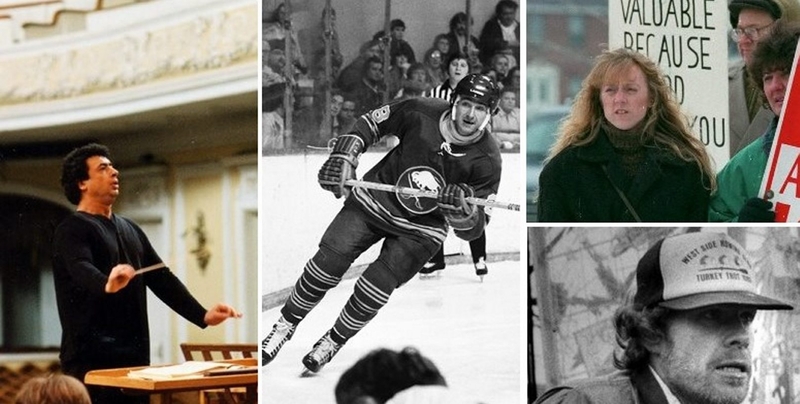 From left, Semyon Bychkov, who led the BPO from 1985-89; Jim Lorentz, former Sabres and longtime TV broadcaster; pro-life activist Karen Swallow Prior, and Billie Lawless (bottom right), whose ‘Green Lightning’ caused a sensation in 1984. On a late-November day in 1984, Buffalo artist Billie Lawless got word that his controversial public sculpture, “Green Lightning,” was being demolished on the orders of Buffalo Mayor James D. Griffin. So he did what any self-respecting artist would do: He drove down to where the sculpture had been unveiled just days before on a patch of grass between Elm and Oak streets and climbed atop the 30-foot structure in an attempt to prevent workers from cutting it down. Lawless, whose work has been embraced in Chicago and Cleveland, has no reason to be nervous any more. And aside from that brief and terrifying moment he spent on top of his teetering sculpture, he said there was never a time when he bore any ill-will toward his native city. He moved to Cleveland around 1990, after the “Green Lightning” fiasco and the first of the subsequent court battles played out. He is now working out of his large studio in the city, where “Green Lighting” currently sits in storage. “Green Lightning” was on view for 10 years in Chicago, where hardly anyone batted an eye at the neon depictions of dancing male genitalia in top hats that prompted Griffin to label it “obscene” and order its removal. Lawless’ work was included in a late-1980s exhibition on censorship at the Cleveland gallery Spaces. After the exhibition, he said, he decided to make a life for himself there. Right now, Lawless said, he’s working on a large version of Noah’s Ark that includes a depiction of the biblical story of Cain and Abel. He cites the artists Alexander Calder and Christo as influences, saying that most of his work is designed to be moved from place to place rather than plopped down in one location forever. So does that mean “Green Lighting” might some day make a return trip to Western New York? It was more than six years ago that former Buffalo Sabre analyst Jim Lorentz essentially said he was leaving the booth to go fishing. And despite some skepticism at the time, that’s exactly what Lorentz did. Tired of the travel required for the TV job, Lorentz left his seat alongside play-by-play man Rick Jeanneret to go fishing and write a book on Atlantic salmon fishing. Lorentz, who had written for some fishing magazines, concedes that writing a book is a lot harder than playing professional hockey. He played for the Sabres from 1971-78, most memorably earning the nickname Batman after killing a bat in Memorial Auditorium during the 1975 Stanley Cup finals with Philadelphia Flyers. He doesn’t expect to get rich on book proceeds. Lorentz, who is about to turn 67, misses very few TV games. What does he think of the team? Lorentz was shocked by the quick departure of Pat LaFontaine as president of hockey operations. He is a fan of Coach Ted Nolan. Lorentz still watches games like an analyst and wishes he could explain some things going on. And what is his view of Sabres analyst Rob Ray? Lorentz also agrees with my criticism of Ray. He doesn’t regret leaving the booth and isn’t envious of Jeanneret, who also has tired of traveling but has been able to work a reduced schedule. He believes it might take a while before the Sabres can turn it around and become more watchable. In many ways, Karen Swallow Prior reflected the local pro-life activist movement that so dominated the Buffalo area from the late 1980s through the 1990s, when Western New York served as a key battleground in the national abortion debate. Prior left Buffalo in July 1999 for a teaching job at Liberty University in Lynchburg, Va. She’s still there, almost 15 years later, primarily teaching British literature and having spent 4½ years chairing the university’s Department of English and Modern Languages. At Liberty, she’s received numerous awards, including the Chancellor’s Award for Teaching Excellence last year. Prior has always been her own woman, never afraid to stand up for what she believed. In Buffalo, she was an academic in the pro-life leadership so dominated by the clergy. No pro-life activist earned more respect from the pro-choice side. And she was a feminist in the male-dominated ranks of the pro-life leadership. So how has all that played at Liberty University, founded by the late, controversial Rev. Jerry Falwell? A few examples: She’s served as the faculty adviser to Students for Stewardship, Liberty’s first environmental club. She followed her old Common Ground activism with something called Level Ground, helping foster dialogue at a Los Angeles film festival between people of faith and the Lesbian, Gay, Bisexual and Transgender community. And she still proudly displays on her office wall a plaque for winning a leadership award from the Buffalo Feminists for Life. The 49-year-old Prior said her pro-life convictions have remained as strong as ever. But living now in a rural area, she’s devoted her passions and energy increasingly to other causes, including the Humane Society, agricultural and animal welfare and spaying/neutering. Prior was asked how she now views her public role during the abortion debate in Buffalo. And her Buffalo days helped form the person she has become, shaping her convictions and her faith. John David “Dave” Munday, the rural Canadian diesel mechanic who made a splash – literally – by going over the falls in barrels in 1985 and 1993, left the area in 2000 to start a new life in a small fishing village in Cape Breton, Nova Scotia. Munday, who was even liked by the Niagara Parks Police officers who tried to keep him away from the falls, quickly developed a close network of friends and neighbors there – most of whom have never seen the falls and therefore cannot quite grasp their daredevil friend’s accomplishment. One neighbor did get a chance to travel to Niagara Falls and visit the cataracts Munday has gone over twice. “He couldn’t believe it, eh?” Munday said, laughing. Munday was born in Hamilton, where he lived until he was 8, when his father moved the family to a farmhouse in Caistor Centre. Munday worked as a diesel mechanic, but in his spare time flew both small airplanes and helicopters and made thousands of recreational parachute jumps, eventually becoming a skydiving instructor. In his mid-40s, his thoughts turned to the Horseshoe Falls, which was on his mind ever since an encounter he had as a child at the Canadian National Exposition with Major Hill, a rapids barrel-rider and member of the famous Hill family of rivermen. In 1985, Munday, 48, made his first attempt to go over the falls in a barrel he and his brother-in-law, Ross Whitaker, designed and built in Munday’s shop. His crew launched the barrel from well above the brink and the barrel became trapped by the Ontario Hydro water control dam, which sticks out 2,000 feet from the shore 8,500 feet from the brink. Munday was mortified when Wesley Hill, Major Hill’s brother, threw a rope on the barrel and knocked on the hatch, and he had to open the hatch and climb out. “I always wanted to meet you, but I thought it would be down below,” Munday told Hill. After paying his fine and picking up the barrel, Munday succeeded in going over the falls on Oct. 5, 1985. He built a different barrel and rode it through the Whirlpool Rapids on Oct. 11, 1987. But stung by press descriptions of his self-designed Falls barrel as “high-tech,” Munday designed a stripped-down version, just a long steel pipe covered with sprayed-on foam insulation, to take the plunge again. This barrel was launched early in the morning of July 16, 1990, but ground to a halt in the low water on the rocks at the brink of the Horseshoe. The barrel remained perched for two hours in the precarious spot, until Munday’s crew chief, Dan Perri of Thorold, brought a large crane to the brink to pluck the barrel from the water. Munday succeeded in going over the Horseshoe again on Sept. 26, 1993, in a converted steel diving bell. In the summer of 2000, retired from his job and with his daredevil days mostly behind him. Munday pulled up stakes and moved into a modest home in Cape Breton. He turned 77 this month. Unlike Brazil, or Sweden, Buffalo isn’t known as a birthplace of internationally known supermodels. But the Queen City can claim the legendary Beverly Johnson, and at least one other woman who knows her way around a catwalk or a photo studio. Jessica White, the East Side native who started modeling when she was a teenager at Kensington High School, made it to the top of the industry by her 20s. She had eight appearances in the Sports Illustrated swimsuit issue – once, in a blow to her hometown, with a Miami Dolphins jersey painted on her body – contracts with major beauty and fashion companies and appearances in the gossip pages linking her to a string of celebrity boyfriends. When we last wrote about White at length, in 2008, she was taking a break from the fast-paced modeling life, moving back to her hometown of Buffalo, reconnecting with her church and launching a foundation to help abused children. She even registered to vote – as a Democrat – during her return to Buffalo, and said she was building a seven-bedroom dream house in Orchard Park. What has White, who turns 30 in June and is still as lovely as ever, been doing since then? Through her agency, she declined an interview request. So we had to turn to the public record to answer that question. White hasn’t graced the pages of SI since 2011, but she still gets regular work with companies such as H&M, for whom she modeled lingerie, and with makeup giant Maybelline. And in late January she went on BET’s “106 & Park” to talk about her new lingerie line. “I want to inspire all women no matter what shape and size they are,” White said, though she didn’t offer details on when and where the intimate apparel would be available. White is active on Twitter, where she has 25,100 followers, and she frequently posts glamorous pictures to Instagram. She’s a regular on the red carpet and socializes with fellow supermodels, actresses and other boldfaced names. She’s also gained attention for her dating life, with reported relationships with ex-Bill Terrell Owens and bad-boy actor Sean Penn. White was charged in 2010 with assault and harassment after allegedly slapping a woman in a fight over a cab in New York City, but the counts were dismissed in 2011 and White was ordered to perform community service, New York magazine reported. She also said she was taking meditation classes given to her as a birthday gift by rap mogul Russell Simmons. There’s no indication she ever bought or moved into the house in Orchard Park, nor do we know whether she followed through on her plan to take classes toward earning a GED. As for her Angel Wings charity, White held a fundraising golf tournament in 2009 in Orchard Park, and she has held fundraising parties on Long Island every May since 2010. The events are considered a highlight of the Hamptons social calendar. White said in the BET interview that she is filming a TV show – perhaps the reality show for the Style Network widely reported last year – and said she wanted to do more acting in 2014. “This year, I’m gonna be really insane. But I’m ready. I’ve been waiting my whole life to kind of step out and get people to know who I am and just see who Jessica is in anything I have to offer in entertainment,” she said. In his absence, Terry Anderson became a presence. Most of us never knew him personally. But from 1985 until 1991, the name of the former Batavia resident and longtime hostage was on almost every Western New Yorker’s lips. He had his sister, Peggy Say, to thank for that. Anderson was taken captive while working as a reporter for the Associated Press in Lebanon in 1985. He had not lived in Batavia for years, but he still had a lot of family there, including several of his classmates from his graduating class at Batavia High School. When Anderson didn’t come home for nearly seven years, people fasted and prayed and held vigils. They wore silver bracelets inscribed with his name. A sculpture bust of him was made and displayed in the Genesee Country Mall in Batavia. “I love you, I miss you very much,” Anderson said to his family and supporters, in a taped statement in 1988. Finally, in December 1991, Anderson was freed. His return visit to Genesee County a few months after his release – when he went to the mall and broke the chains on that bust – drew thousands of people. During his captivity, Anderson – who became a household name in part through the tireless efforts of his sister to win his freedom – turned into something of a cultural touchstone. Anderson didn’t move back to Batavia after his release and Say had moved away while he was in captivity. Anderson was living in Kentucky, as of his last visit to the Buffalo region in 2011, and teaching journalism at a college there. Say relocated out of state with her husband, David Say. He died in 2012 in their hometown of Cookeville, Tenn.
Anderson, when contacted by The Buffalo News for this story, said that he didn’t want to talk about his life and what he is doing now. It’s easy to figure out where Semyon Bychkov is now. Just hit Google. At the moment he is at Covent Garden, the world-famous opera house in London where Prince Charles, once upon a time, used to drag a reluctant Princess Diana. You could almost call Bychkov the maestro without a shadow. He never stands still. Now, Bychkov freelances, conducting at high-profile places including Covent Garden, the Metropolitan Opera, and La Scala in Milan. About once a year, he tours America leading various orchestras. On the phone from London, he said he loves his freedom. “I am conducting ‘Die Frau Ohne Schatten’ for the first time in my life,” he adds. “For many years, I have had great identification with the music of Strauss.” He is looking forward to his next overwhelming project, which is conducting Moussorgsky’s “Khovanshchina” at the Vienna State Opera. Bychkov fell in love with Moussorgsky’s “Boris Godonuv” when he conducted it a decade ago at the Met, and can’t wait to dive back into the moody Russian’s work. A few things in Bychkov’s constantly shifting life, fortunately, are constant. One of them is his wife, Marielle LaBeque, one half of the flashy two-piano sister duo the LaBeque sisters. Bychkov met her in 1987, during his time in Buffalo, and they married in 1999. They have lived for years in Paris. Bychkov, though, still treasures his American citizenship. His two children, now grown up, live in the United States, one in Washington, D.C., and the other in New York City. He said he treasures his memories of Buffalo. And he proves it: Though his publicist doubted he had time for any interviews, he made time for this call.